I love USB flash drives. I think these little suckers are one of the best things to hit computers since sliced bread. I used a flash drive almost every day this past semester of school and boy was it a nifty thing to keep around. Almost every piece of school work I had to do this past semester is on my trusty 2GB Toshiba flash drive. Now, my flash drive is your average one. It is nearly the same size as all other flash drives and is able to be clipped on my key chain or stuck in my pocket.However, I'm sure there are some of you reading this that prefer your flash drive to be tiny and really easy to carry around with you. Well, if tiny is how you like your gear, then you will definitely want to check out the newest USB 3.0 flash drive released by PQI because this little guy is just that, little. 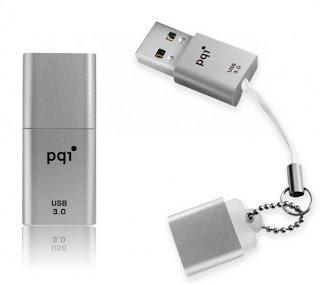 This newest flash drive out of PQI is known as the Traveling Disk Drive U819V and is, as PQI claims, the smallest USB 3.0 flash drive in the world. When PQI says that this thing is small, they mean that this thing is small. The U819V measures a mere 3cm long and comes with a removable cap that is attached to the USB drive via a lanyard. The U819V uses COB encasement technology which surrounds the components in order to keep them cool by helping dissipate the heat generated while in use. The arch nemesis to technology is heat, especially when it comes to memory that loses performance as it heats up. You can get the U819V in a plethora of storage sizes ranging from 4GB up to 32GB if you really really need all that space. The device measures 3.15 x 14.8 x 7.3mm making it the perfect size to lose as soon as you open it. It weighs 3.6 grams and works with both USB 2.0 as well as USB 3.0 ports. Data transfer when connected to USB 3.0 is claimed to be 5Gbps, which is pretty good. Pricing of the U819V has yet to be determined but don't be surprised if these little buggers are a little more expensive than your run of the mill flash drives. Word of warning, don't blow a lot of money on the 32GB if you are in the habit of losing things.